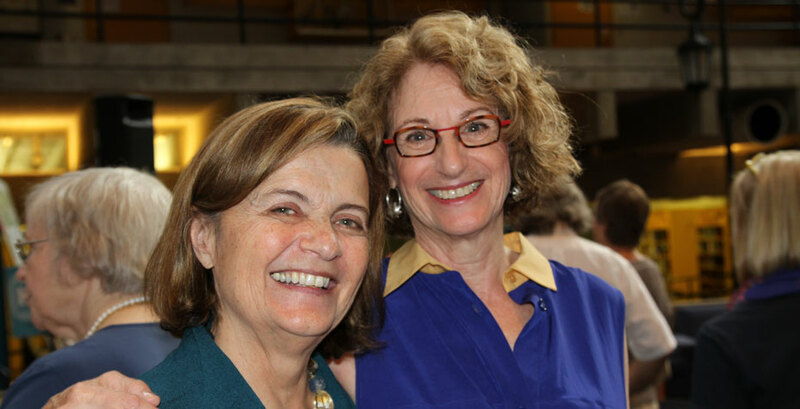 In a celebratory reception in the Science Center on September 12, Kolodny's contributions to Wellesley and to women in science generally were extolled in greater detail, and colleagues, students, alumnae, and friends officially wished her a happy transition to professor emerita status. A 1964 graduate of Wellesley, Kolodny received a Ph.D. from the Massachusetts Institute of Technology in 1969. As a member of the Wellesley College faculty from 1969 to 2013, she taught chemistry courses ranging from introductory chemistry to physical chemistry. Kolodny developed and taught The Nuclear Challenge, a first-year seminar that deals with nuclear issues beginning with the Manhattan Project and examining both nuclear weapons proliferation and peaceful uses of nuclear energy, such as electricity production and nuclear medicine. In addition to her contributions to the growth and well-being of Wellesley, Kolodny has been active in the Greater Boston Jewish Community, serving as president of the corporation of the Solomon Schechter Day School of Greater Boston, president of Congregation Shaarei Tefillah of Newton, Mass., as a founding board member of the New Jewish High School of Greater Boston (Gann Academy), and as a member of the board of the Rabbi Joseph B. Soloveitchik Institute.